I'm not a scientist or a nutritionist, just a chick trying to eat real foods. I dove headfirst into a paleo lifestyle a month ago, but I'm drowning in nomenclature. Much of what I read here I don't understand. I'm smart enough, sure, but I just don't have the vocab down yet. Can you help me understand PUFAs? I googled and found the wikipedia entry that tells me there are three kinds of PUFAs: Omega-3, Omega-6, and Omega-9. From reading this site, I think I've figured out that 3 is good? 6 is bad? Why doesn't anyone mention 9? Is there a handy list somewhere that says: Eat These Foods, they have a good PUFA ration? Stay Away From These Foods, they are Omega-6 death bombs? I feel really stupid, I'm sorry for asking such a basic question. I am wanting to be as healthy as I can be, and stepping away from conventional wisdom is still messing with my head, especially when I read page after page of things I don't understand. A month ago I thought that all I had to think about was frying up eggs and bacon in the morning, and enjoying salads with meat at lunch, and hearty dinners of potroast and cabbage like my grandmother used to make. But now, it seems as though there are all of these other considerations and my head hurts. It's "voila." Sorry to be nitpicky, but it's a major pet peeve. Yeah, the PSS podcasts are great. If you haven't read them already, I always tell people that you can get a nearly complete education in nutritional biochemistry by reading just two blogs: wholehealthsource.blogspot.com and paleonu.com. Of course you will learn a lot by reading the other ones mentioned, too, but if you read those two from start to finish, you'll have a very solid grounding in almost all of the important topics. I think these two blogs also do the best job of demonstrating (for non-scientists) HOW to think carefully about nutrition, not just WHAT. If you think PUFA is confusing, wait until you get to cholesterol. ;) There were about six or seven points where I thought "ok, NOW I have a pretty good picture of cholesterol" and then I would read something else that would make the picture more complicated! Don't worry about it too much. In the end, the basic answer is always the same. Eat real foods, avoid processed food products. The details are sometimes important, but not worth stressing over in the beginning. Btw, what is healthy for somebody without any glucose sensitivity (ranging from poor blood sugar control to frank diabetes) may not be healthy for somebody with such sensitivities. I think starch is basic human food. That said, for those who, due to non-paleo years, have damaged their ability to tolerat starch, a higher fat diet may be more suitable. Alternatively, complex carbs (like grains) may be used, provided no gluten intolerance. Corinne, I think these comments are getting into the difference between "re-creationism" and modern paleo. I really wish someone else would chime in. I eat saturated fats (coconut) and monosaturated (omega-9) as much as I want. Thanks for the tip, Belinda. I will start listening in to that podcast. Aren't veggies important not because of the calories but because they have a lot of minerals and nutrients? Or do we not need to eat veggies at all? Boy, all of this is confusing! Shebeeste, yeah, it is definitely confusing as heck. I am not eating any grains right now and feel better not doing so. I haven't read that oats are okay - do they raise blood sugars like other grains? I used to really love oatmeal in the morning. Thanks, Ben, this is helpful. What does inflammation really mean? I keep seeing it used and I picture the cells inside my body swelling up. Is that what happens? Is it something else? Why is inflammation bad? Melissa, this is really helpful. How about omega-9? Is that something that we need to think about, too? I never see anyone mention it. Does coconut have a lot of omega-6? Veggies are not very caloric. I don't see why hunter gatherers would eat them much. There are examples of healthy cultures basing their diets on all the things I mentioned, except maybe oats (unless you count WAP's observation of those living in the outer hebrides). I don't want to get too off topic or create more confusion, but the original poster should note that oats aren't paleo (though some folks choose to still eat them). I'm also not sure why herbs and vegetables are only to be used occasionally. I think most paleo/primal folks would favor herbs and vegetables over fruits, plantains and sweet potatoes. There is always some debate over the "exact" definition of paleo, if any, but I hope someone can chime in here and clarify this point for Corinne. Who, BTW, asked a very good question about PUFAs. AH, forgot that one, added it. It's a good one to get. This is very helpful. Where does EPA fall in here? It's an omega-3 also, right? You should feel good about asking this question. When I first started Paleo a year ago, I had no idea that omega-3 was a polyunsaturated fat. Asking this question now will get you started on the right foot, and will help other newbies on this site! ALA is the omega-3 fat generally found in plants. DHA/EPA are the omega-3 fats generally found in animal foods. LA is the essential omega-6 fat generally found in large amounts in plants, though more than enough is found in animals, so don't worry about getting enough. Arachidonic acid is the omega-6 fat generally found in animal foods. 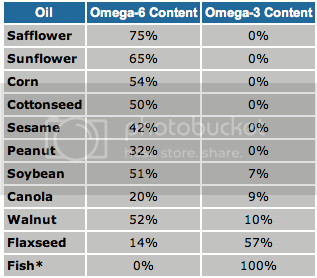 Omega-6 fats aren't BAD, the Western diet just provides them in inappropriate ratios, types, and amounts. What to keep in mind about them? Amount: Dr. Kurt Harris and many others recommend keeping the total amount of PUFAS low- 4-10% of calories. Ratio: Large numbers of studies show the optimal ratio of omega 3 to omega 6 is around 1:1-1:4. Type: Omega-3 from DHA is generally better absorbed, since ALA has to be converted to DHA/EPA before our bodies can make use of it. Rule of thumb: Limit plant fats, particularly those from seeds and grains. Animal fats are more complex, but seafood and meat from animals whose natural diet is grass (cows, bison, etc.) provides the best ratios/amounts/types. If an animal eats grains or seeds, like most pigs and chickens, it can pass inappropriate ratios and amounts of fat on to you. Saturated fats are molecularly stable; resistant to degradation. PUFAs, by nature of their molecular arrangement, are less stable and more reactive to things like oxygen. A PUFA oil left open on the countertop will quickly react with the air and quickly go rancid, while a saturated fat would remain fresh and intact. 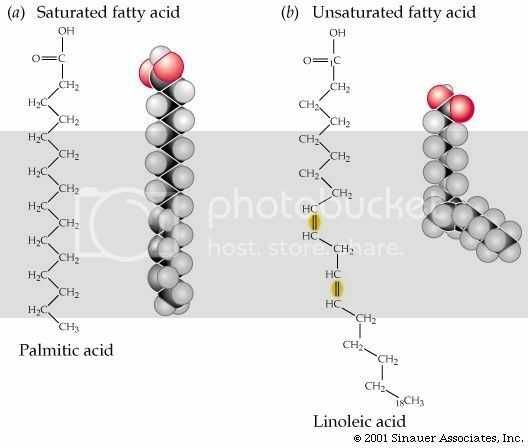 http://img.photobucket.com/albums/v53/Flare8/he/satvsunsat.png (don't take this second picture to imply monounsaturated fats are unsafe, just try to get the image in your mind of how PUFAs may be inherently unstable). The body is a hot and busy place where stable fats can run safe but unstable fats are prone to breaking apart. 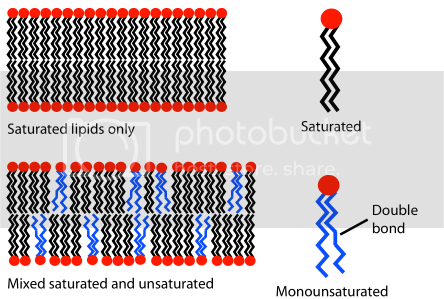 When PUFAs do break apart in your body, its like glass shattering and all the shards damage whatever they come in contact with: damaging blood vessels, interfering with signal receptors, interrupting cell's energy production, etc. One of the reasons PUFA damage seems long-term rather than immediate may be because PUFA stacks up in your fat tissue and accordingly does progressively more damage. Your body can deal with some degradation of fats (e.g. oxidation), but too much combined with too little nutrition (e.g. weak antioxidant powers) means you become overloaded and start breaking down as an organism. When you cool saturated fats (like butter), they become solid. Plants, grains, and certain cold-water fish are often in cold environments, so if they had saturated fats they would harden up like a chilled stick of butter and that would be bad for their survival. They need some fats so PUFA is their only choice. Note how plants that live in warm climates, like coconuts, carry predominately saturated fats. Humans are warm-blooded so we too are primed for saturated fats. Some animals, called 'ruminant' animals such as cow or lamb, have a lot of evolutionary experience consuming grasses, grains, etc. They somehow have mechanisms to detoxify or otherwise deal with PUFAs and convert them into saturated fats. You can feed a cow grains and its fat will not be filled with PUFA. Other animals (non-ruminants) such as humans or chickens, do not have evolutionary experience consuming grains, and they do not have mechanisms for detoxifying/dealing with much PUFA. Feeding them PUFA causes PUFA to stack up in their fat tissue. The human body may use small amounts of certain PUFAs for some signaling purposes. An excess of certain PUFAs (e.g. omega 6) may translate into an excess of certain signals, which may cause bodily dysfunction. I think all PUFA consumption should be limited. Some say omega 3 PUFA supplementation is desirable in order to balance the grain-derived excessive omega 6 PUFA, but here are studies i've come across suggesting harm from omega 3/fish oil http://flare8.net/health/doku.php/misc#fish_oil . Clinical trials supplementing omega 3 sometimes see good benefits, but I think the same benefits could be accomplished by reducing omega 6 (i.e. corn oil) consumption. I think the safe 'do what's evolutionarily accordant' thing is to seek overall low intakes of PUFA. Ruminant animal fat is always acceptable. Non ruminant animal fat is unacceptable if the animal was fed corn soy etc, but is acceptable if they were fed natural diets (like a 'pastured' chicken). Corn/soy feeding is the norm in USA. Sometimes its different in other places. I would buy supermarket beef but would make an effort to buy pastured eggs. If I had to shop at a supermarket I would prefer beef and lamb over chicken and pork fats. I would eat skinless chicken because that has almost no fat in it. It's easy to think in terms of ratio.... But, ratio is likely only important if you get your omega 3s from plant sources (e.g., olive oil) rather than animal sources (e.g., wild oily fish, like salmon and sardines, or grass-fed dairy). Otherwise absolute amounts is important. I'm not going to give extensive references (since that would take time and you said you just wanted a primer anyway...), but you should aim for about 2-3 grams of animal-based omega 3 per day and no more than 3% of your calories from omega 6 oils. Dairy/beef has about 2% omega 6. Potatoes (sweet and regular) have 0%. Oats have 4.5%. Coconut oil has 2%. Olive oil has 9%. Chicken fat has 12%. Eggs (even some so-called omega 3 eggs) have between 8 and 15%, depending on how much soy is fed to the hens. Other vegetable and nut oils must be avoided as they have very large amount of omega 6s. Basically, you can't go wrong if you base your diet on grass-fed dairy and beef, organic (preferably pasture-raised) eggs, wild caught salmon and sardines, coconut, fruits (especially organic berries), plantains, sweet potatoes, maybe some oats, and the occasional herb (rosemary, oregano, etc) and vegetable (especially cruciferous). 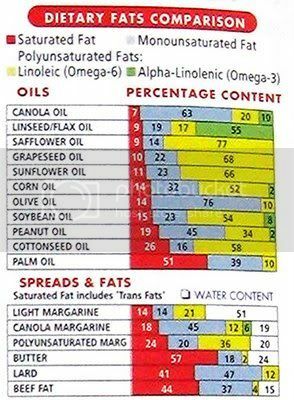 summary answer: avoid all commercial veggie seed oils (generic veg oil, corn oil, canola AKA rapeseed oil, soybean oils) that are high in O6 - basically anything that sells for 5 bucks in a drum, limit nuts, eat high quality fish oil or sardines/salmon for O3. PHD ray peat thinks all PUFAS are non-essential and are harmful. "To defend the seeds from the animals that would eat them, the oils block the digestive enzymes in the animals' stomachs." "The enzymes which break down proteins are inhibited by unsaturated fats, and these enzymes are needed not only for digestion, but also for production of thyroid hormones, clot removal, immunity, and the general adaptability of cells. The risks of abnormal blood clotting, inflammation, immune deficiency, shock, aging, obesity, and cancer are increased. Thyroid and progesterone are decreased. Since the unsaturated oils block protein digestion in the stomach, we can be malnourished even while "eating well." "
"Some of the unsaturated fats in fish are definitely less toxic than those in corn oil or soy oil, but that doesn't mean they are safe. Fifty years ago, it was found that a large amount of cod liver oil in dogs' diet increased their death rate from cancer by 20 times, from the usual 5% to 100%. A diet rich in fish oil causes intense production of toxic lipid peroxides, and has been observed to reduce a man's sperm count to zero. [H. Sinclair, Prog. Lipid Res. 25, 667, 1989.] "
"It's a whole system of promotion, advertising, and profitability. " There's lots of good stuff on the web (PaNu, Mark's Daily Apple etc), but it can seem like an overload of reading info. I suggest that if you have time and an iPod, try and listen to Robb Wolf and Andy Deas' podcast, the Paleolithic Solution. It might all seem confusing at first, and there is a bit of cross-fit stuff that may or may not be relevant, but after a while the info all starts to come together and make sense - particularly as he goes into the biochemistry behind it. n3 are generally good, yes. n6 are not innately evil, though. We have to keep in mind that the evolutionary model we more or less emulate is approximately an intake ratio of roughly 1:1. That means consume equal portions of n3 and n6 fats. Most americans (hell, i think many paleos too for that matter) take in way, way more n6 than n3. Therein lies the problem. When the ratio gets very high with the n6 youll be getting into a state of general inflammation. This systemic inflammation is more and more coming to be understood as the riptide sucking many of us out into the sea of adult-onset disease. An easy way to really keep your n6-intake in check is to avoid pretty much all nuts, seeds, and their respective oils. The exception being olive oil and mac nut oil. Nuts and seeds across the board have a high n6-level. If you eat a lot of good quality meat, wild caught fish, and salad-type veg i think your n3:n6 ratio will more or less take care of itself. Yeah - information overload. The best way to look at inflammation is to read about prostaglandins. There's a lot of explanation if you read about series 1 (omega 3) & 2 (omega 6) in relation to PCOS. A good way to get over a fear of saturated fat is to read the wikipedia entries (@ nov 2011) on each individual saturated fat found in coconut oil - I think two of them are "good" & one neutral, even in terms of the lipid hypotheses(the-saturated-fats-are-bad official line). "Good" fats fix up your TC:HDL cholesterol ratio, because high density lipids (HDL) are nice to your arteries and total cholesterol being high is ok and long as they're mostly large and fluffy HDLs. And remember monounsaturated fats are "good" and animal fat is actually made up of monos(omega 9s), and saturated, and pufas(omega 3 & 6).